Jeff Noll's 1967 Camaro and Jim Mokwa's 1969 GTO had already been disassembled to one degree or another, before they purchased the cars. 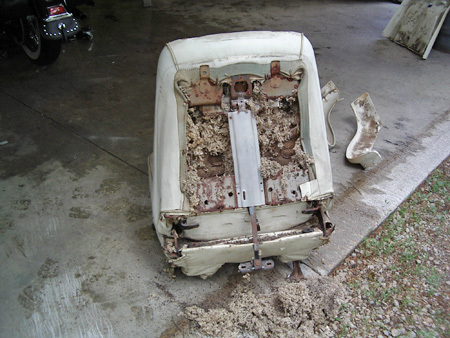 Jeff's car did have seats installed, but in Jim's case the interior was completely gutted and stripped out of the car. Because of this, we found another Camaro to illustrate the teardown of an interior. This car is a 1969 Camaro SS Sport Coupe owned by Lori Fuller. Lori had decided to have this car fixed up in honor of her husband — a car enthusiast — who was killed in a California auto accident along with their daughters. The car needed a little paintwork and a lot interior work. Unfortunately, Lori had some terrible luck picking shops to do the job. The first place the car went to kept it for a long time and accomplished nothing. She finally got the car back and took it to a second shop where the operator asked for deposit money in advance. Then, he partially disassembled the interior, but failed to buy and install a new interior kit. He failed to finish the project at the agreed time. Luckily, a local body shop and a major supplier of Camaro interior kits from California came to Lori's rescue after they heard the story behind the restoration. John Diermeier, is the owner of John's Custom Auto in Manawa, Wis. — where Lori's mom was a teacher. After talking to several companies that supply Camaro interior kits, John finally got hooked up with Classic Industries in Huntington Beach, California. Originally founded in 1976, Classic Industries started out selling small items for the restoration of early model Camaros in a small facility in Palm Springs, Ca. Since then, the company has expanded from operating out of the trunk of a Camaro to two massive corporate campuses and an expansive warehouse for housing one of the largest inventories of parts and accessories in the business. Classic Industries has been featured on many major TV shows, such as "Overhaulin,'" "Chop," "Cut, Rebuild" and "My Classic Car." It has appeared in numerous magazines, including Hot Rod, Car Craft, Hemmings Motor News and most publications that feature classic and muscle cars. The dash pad is one of the parts you're likely to be removing as you start disassembly the car's interior so that you can restore it. Classic Industries made all the parts for this '69 Camaro and had them in the right colors, too. Camaro door handles and window cranks are held on with clips that snap in place on the back of the parts. A special tool is designed slip over the shafts of the cranks and handles and push the clips out. The tool is sold by many of the interior kit suppliers and tool suppliers listed in the back of this book. The clip should be between the handle and the white or gray plastic washer. Just insert the tool up against the clip and push the clip until it pops off the handle or crank shaft. The arm rests also help to hold the door panels in place. They are fastened to the inside of the door by long screws that thread into deep-set holes that are hidden on the under side of the armrests, Simply reach a Phillips head screwdriver into the hole and turn the attaching screw counter-clockwise. Taking off a 1967 Camaro interior door panel is simple. First, remove the screw above the inside of the door handle. Then remove the screw under the armrest (as we already covered above). Next, take out the screw in the map pocket area and the screws under or behind the cover over the door latch. Then, lift the door panel up and away from the door, moving it towards you as you lift it. 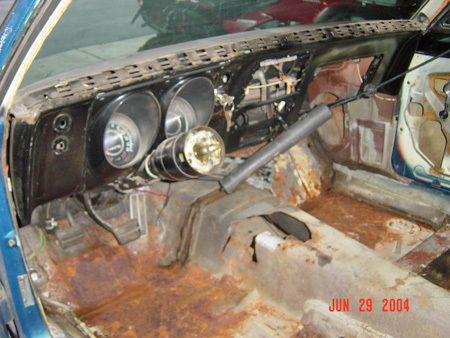 To remove 1969 Camaro kick panels (the trim panels ahead of the doors and under the dashboard on both sides of the car), start by removing the heater core on the passenger side of the car to allow for removal of the kick panel. On the driver's side, remove the emergency brake. Next, unscrew and remove kick panels. Install new kick panels and replace heater core and emergency brake. Previous owners had cut circular openings in the '69 Camaro's door panels and kick panels to mount radio speakers so they needed replacement. The 1969 Camaro's vinyl interior sun visors have a rod along one horizontal edge and a pin and bushing to fit over it. Chrome plated sun visor supports (one on either side) hold the visor firm, but allow it to swivel. Three special support screws are used in attaching the visor to the car. To remove a visor, take out the three support screws and carefully lift the sun visor down. A bow-type headliner was used in the 1969 Camaro. They have varying sizes as follows (nearest windshield to rearmost in order): 1) and 2) 46-5/8 inches; 3) thin wire (center bow); 4) the longest at 49-1/4 inches and 5) medium size 48-1/4 inches. The bows were factory color coded. They are held in place by bent-over "teeth." When you remove the old headliner, save all of the original hardware and tag both the sequence of each bow and which side is on the left or right (only one has to be tagged). Bend the teeth carefully so they don't snap off. Both factory reproduction and custom headliner kits are available. You will find a row screws along the bottom edge of the Camaro's vinyl dashboard pad. They are just above the metal part of dash. There are four nuts that come up from the bottom. To get at the nuts, you have to remove the glove box, instrument cluster, radio and heater control mechanism. An almost solid steel framework sits under the 1969 Camaro's vinyl dash pad to support it. To take out the center convenience console, remove the black plastic gear shifter button by pulling up. It just snaps in place. Inside the T-handle on the right is a set screw that holds it to the vertical shaft. Loosen the set screw and remove the T-handle. You'll need to remove the shift plate (the plastic part that has PRNDL printed on it) so that the center console can slide over it. Depending on which center console your Camaro left the factory with, the shift plate will be held in place by either four chrome screws or by hidden clips. The screws will be obvious if you see four screws running through the top. If you don't see screws, then it is held in place by clips that are cast into the plate and snap into the gear shifter base. To remove just gently pry up the shift plate until the clips release. A variety of hidden screws hold the pieces that make up the Camaro's center console together. By proceeding in the proper order, you'll be able to get down to the parts that need cleaning or replacing. 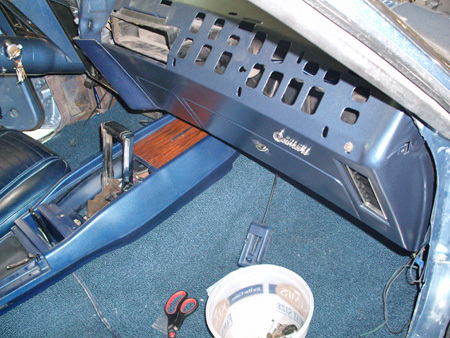 The center console itself is secured by small screws on each side of the front of the console and by two larger screws that secure it to the floor of the car. One of these larger screws is inside of the console storage bin on the bottom and the other is located under the rear cover on the console. Remove the sheet metal screws from the cover, Then, remove the cover and you will see the larger screw. 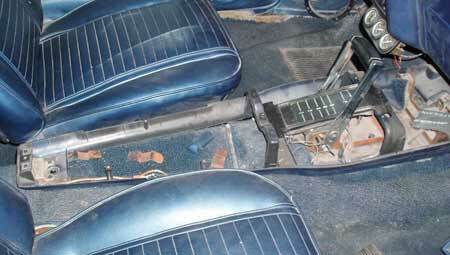 Jim Mokwa's GTO had no seat belts when he got it, but Jeff Noll had to deal with removing the factory seat belts — as well as the belt retractors — in his Camaro. Camaro of different years and different body styles had slightly different seat belt systems. Different floor anchor bolts were used in different models and locations. GM used 13/16-inch hex head bolts with 1/2 inch x 13 threads. Since they were a federal safety item, the threads often had threadlock on them to keep the bolts from loosening. Chrome bolts were used if the fasteners could be seen. The Camaro front seat belt retractors had 1-1/4 inch long chrome mounting bolts with a 5/16 inch shoulder. The mounting bolts for the front center belts were 1-1/2 inch in length with a 9/16-inch shoulder. 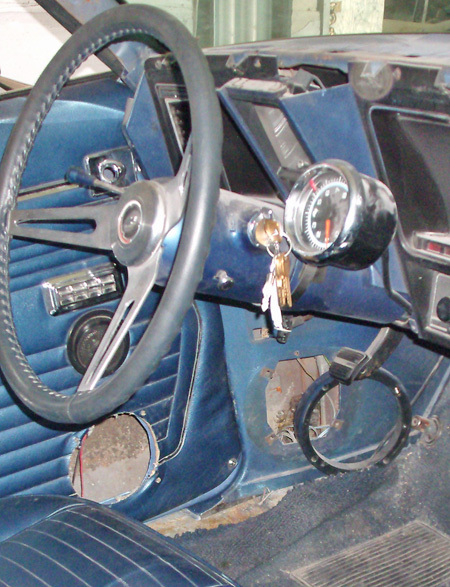 The Camaro front seat belt retractors had 1-1/4 inch long chrome mounting bolts with a 5/16 inch shoulder. The mounting bolts for the front center belts were 1-1/2 inch in length with a 9/16-inch shoulder. In 1967, these were visible and were chrome plated. All rear seat bolts were gold cad plated since they were hidden. They were 1-1/4 inches long and threaded all the way up. 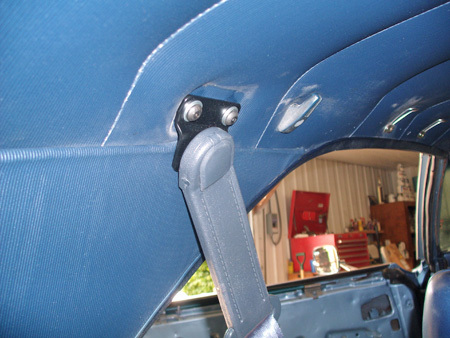 The 1968-1969 front shoulder belt clip was mounted to the roof of the car with two 1/2-inch hex head bolts. They had a 5/16-inch x 18 thread and were 7/8-inch long with a plastic cover. When not in use, the shoulder belts were stored against the headliner on stainless steel hooks with a chrome base that attached with two chrome Phillips-head screws. The disassembly ofall seat belt related parts is pretty much a nuts-and-bolts removal or Phillips head screw removal job. The disassembly of all seat belt related parts, such as this rear shoulder belt attachment at the headliner, is pretty much a nuts-and-bolts removal or Phillips head screw removal job. Bucket seat assemblies for the 1969 Camaro included the seat frame, seat tracks and side upholstered. 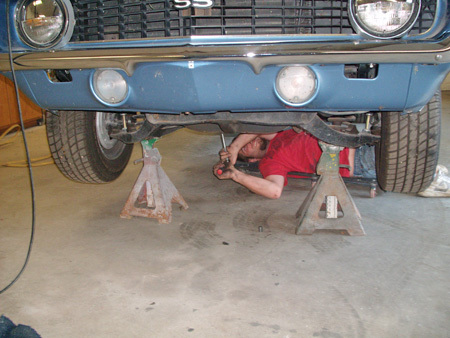 They are bolted to the floor of the car with bolts through specific mounting brackets. Undo the bolts and lift seats out of the car. Bucket seat assemblies for the 1969 Camaro included the seat frame, seat tracks and side upholstered. They are bolted to the floor of the car with bolts that may need to be worked from below. Then, lift seats out of the car. For rear seat removal, there is one hook catch on each side of the car that holds the seat cushion to the floor of the car. You push the base of the seat, by the bottom frame, towards the back, while lifting at the same time. The seat locks in place under tension, so you need to use strength. Kicking it with your knee may help. Two bolts attach the back rest to the rear bulkhead at its base. Remove the two bolts and slide the seat back straight up to unhook it at the top. In most Camaros under restoration, the old carpeting is virtually useless and can be cut out of the car with a razor knife. If the old carpeting is the original and never before removed, you may want to note details like whether wires ran over or under the carpet. However, if you are building a Resto-Mod, the "factory correctness" of the vehicle doesn't count a great deal. Also keep in mind that if you're making interior upgrades in your Resto-Mod (say a custom built console or different seats) the cut of your new carpeting may be totally different and the old carpet won't be good for use as a pattern. 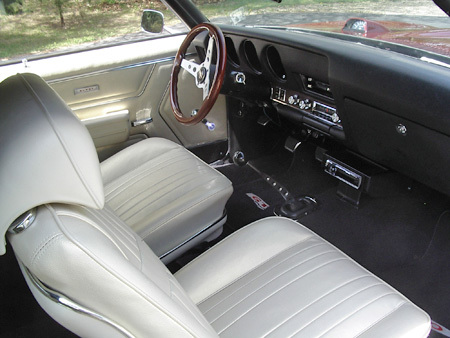 Although there's no rule that a Resto-Mod has to have stock seats, Jeff Noll wasn't going to stick with this upholstery job, which was what he found in the car when he bought it. Jim Mokwa's 1969 GTO convertible had no glass in it. Even the convertible top had no rear window. Whether the old ones was made of plastic or glass, we don't know. On the other hand, Jeff Noll's 1967 Camaro still had almost all of its glass installed, but not for long. Jeff knew that he was going to be sandblasting the car and doing extensive metal fabrication, body work and paint. When he brought it home on May 23, 2004 it had glass. By August 2004, he had iit pretty much torn down, but the windshield was still in it. By October 10, 2004, Jeff was media blasting the glass-less car in the driveway of his home. By the end on June 2004, Jeff had his '67 Camaro interior very much gutted out, but even though he had removed most of the windshield trim and hardware, the glass itself was still in the car. Unless you have some experience working with the clips that hold the chrome on and have the right tools to cut through the butyl tape windshield and backlight (rear glass) gaskets, it is very difficult to get the front and rear glass out of a 1969 Camaro without cracking it. In many cases, the at-home restorer would be wise to call a company that does mobile glass installations to take them out. It should cost around $60 to remove both glasses and later about the same amount to put them back in. Remember, if you break one of them, it will cost a lot more. A professional mobile glass installer will have the right tools to do this job, including suction type grips to remove the windshield or backlight. If he makes a mistake or breaks the glass, he's responsible. Plus, he'll get dirty — not you. If you're bound and determined to do the job yourself, you'll need several tools, including a window trim molding removal tool. When removing the window trim moldings, the top and side moldings at the front of the car come off with the trim tool removal tool, which hooks under them. This tool also takes off all of the backlight moldings. However, the lower windshield molding is held in place with eight clips that are screwed into the body. The only way to access the heads of these screws is to remove them is to lift off the cowl vent. To do this, you must remove four screws that you can see when you open your early Camaro's hood. Other tools you'll need are a cold knife (aluminum rod, with an "L" shaped blade) and a piece of piano wire or cable with handle. The handle will help you pull the cable through the butyl tape. Get a friend to help you. With one of you inside the car and the other outside the car carefully saw through the butyl gasket, Once you've cut through the rubber gasket all around, remove the glass. As Jeff Noll discovered, 1967 Camaros have unique door windows because they have ventipanes (sometimes called vent or wing windows). Ventipanes add extra steps to door window removal. Another difference is that a larger window sash is required. All models have the same quarter windows. When disassembling the door guts, screw fasteners back on the parts they came off so you don't lose them. Mark the spots where the adjustment nuts for the horizontal and vertical window tracks are bolted to the door frame. Start disassembly with the door release mechanism and the latch assembly and rod. You can remove the glass without removing these, but their removal gives you more room to work in. Next, crank the window so you will be able to remove the rear window stop. Then lower it to remove the front stop. Loosen the vertical track bolts. This allows the track to move back and forth so you can slide the glass out without damaging any rollers that are still good. Crank the window all the way down so you see the screws in the sash track (the horizontal track screwed to a frame along the bottom of the window). Removing these actually separates the window and frame from the regulator. Very carefully grab the top of the window and pull it up and out. To do this may require temporary removal of the window opening trim. Be very careful not to catch the rear roller on the door and break it off. Then, remove the vertical rear track and take out the bolts that hold the horizontal track (which doesn't move). Now, unbolt the window regulator and carefully remove it from the door. Next remove the vent window. This is accomplished by undoing a chrome screw above the door panel trim, unbolting the bottom nut removing the nut and bolt at the front of the door. You can then lift the vent window, rotate it 90 degrees and remove it. Record the turns on adjusting screws and write down. Remove the chrome window trim for maximum working space. Unbolt the rear quarter window regulator and remove it. To ease re-installation, mark locations of nuts on the rail. Then, loosen the nuts so the rail moves. Once the rail is loose, gently slide the window up and forward and it will come out. Next, remove the rails and mark where the adjusters go by taping those threads. 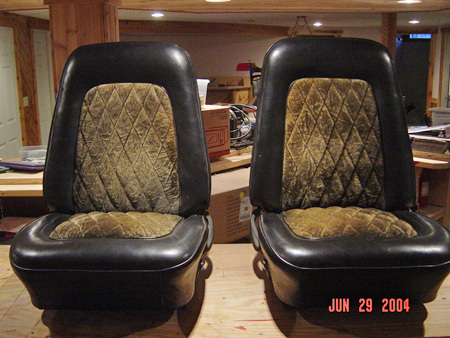 After years of misuse and abuse, this is what the white bucket seats in Jim Mokwa's '69 GTO convertible looked like when he purchased the car in 2006. He had a lot of work to do on the car's interior. Jim redid the interior with PUI (www.puiinteriors.com) seat covers and door panels. The dash pad was by Just Dashes (www.justdashes.com). The job had a long lead time, but he says it was worth the wait. 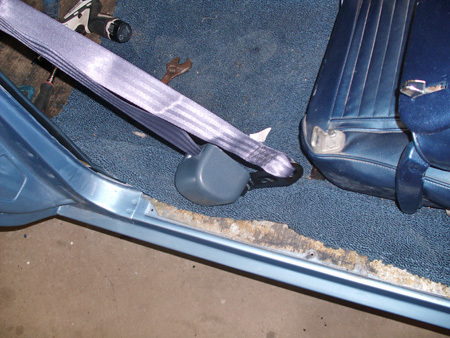 A variety of other parts that might need to be removed from a car preliminary to its restoration could be considered "interior" items. For example, trunk mats, moldings and side panels, door jamb vent grilles, cowl panels, stainless door corner vents, radios and antennas. Once you have the car torn down following our instructions above, dealing with these added items should be a snap. All types of factory manuals are available to help you, as well as lots of information posted on the Internet. Always remember to find out what tools you need, work slowly and take digital photos. Do all this and you won't go wrong. With Resto-Mods you can add non-factory accessories and the suppliers will be happy to provide helpful install literature. 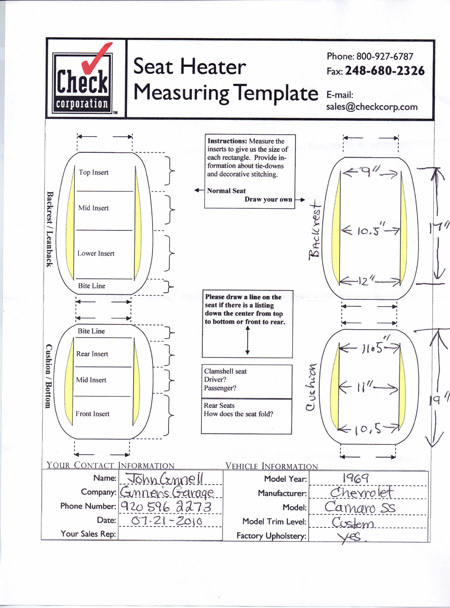 This is a template sheet used for installing aftermarket seat heaters made by Check Corporation. Also remember that there are variations. While we have tried to be very detailed in our disassembly instructions, unless you're writing a book about taking apart just one specific car, the advice is somewhat generalized. Removing a seat belt retractor from a 1969 GTO convertible may not require exactly the same steps as removing as similar part from a two-door hardtop. Also, the step-by-step instructions for taking apart a standard interior may vary somewhat from those that apply to the same car's deluxe interior. On top of this, building automobiles is not an exact science and was even less so back in the 1960s. If a factory was cranking out Camaros by the dozens every day and ran out of one type of trim attaching screw, there's a good chance that a substitute screw that worked OK might have been used in that application until a new shipment of the correct screw arrived. There are also cases where the design of various parts and assemblies was improved as a "running production change." For instance, Camaro experts say there is some debate whether both four bow and five bow headliner designs were used in 1969 models. So don't always believe everything you read in a book-even a factory assembly manual. To be a good restorer, you have to stay somewhat flexible and use your talent and common sense when you run into something that doesn't make sense.